Today, when you order "Showdown by Jason Wethington", you'll instantly be emailed a Penguin Magic gift certificate. You can spend it on anything you like at Penguin, just like cash. Just complete your order as normal, and within seconds you'll get an email with your gift certificate. 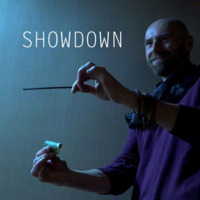 Showdown by Jason Wethington (Instant Download) Your new favorite impromptu miracle. Do it anywhere, anytime. Borrow a bill, borrow a pen and you're READY TO ROCK. All you need to do is SHOW UP. START LEARNING INSTANTLY. Jason Wethington has been doing magic for a long time. He creates for his own act, so when he publishes anything you know it's a worker. Showdown will be your new favorite impromptu miracle. It uses just 2 props, a pen and a dollar. They can be borrowed, so all you need to perform SHOWDOWN is to SHOW UP. This is a great little trick! It is truly impromptu... borrowed pen, borrowed dollar, zero prep, one tiny, itsy, bitsy move. It can be done surrounded and it is very visual, the way I like it. I've seen a variation of this before that, to me, seems a little too obvious. To a drunk spectator, yeah awesome dude! But anyone slightly sober would be like, "oh that's cute". However, that variation is not nearly as good as this one! Granted, if you think you know how this is done, you're probably about 85% right. But there are some little problems with my imagined solution. When I watched Jason give the explanation, it turned out that my solution was the right idea, but not exactly there. Jason's solution works great and, if I would have tried "my" version, I'm sure I would have had "FAIL!" somehow pop up over my head. So, it's a really good trick. Even if you think you know how it's done, unless you're willing to work at it and make some mistakes along the way, I say get this. Jason teaches some nice subtleties that really make this work... it's the difference between an experiment gone wrong and a very visual (and tactile) piece of magic. To be honest, I think the price is a tad high for the trick (which is mostly the reason for docking off a half point)... but again, it's visual and the price is definitely affordable. I'd rather pay the current price than figure this out through trial and error. I think I would have been happier to pay $4.95 for this one, like a blizzard trick... but at the current $9.95 price, I am still satisfied. Great job, Jason! Get this, folks! 62 of 64 magicians found this helpful. This is a nice clean trick. Jason does a great job teaching it very slowly and methodically so that even someone new to magic would have no problem performing it. Every so often while explaining it he hold the bill parallel to the camera and you can't see what he's doing but the effect is so over taught you'll have no problem getting every point. I personally didn't care for the patter, although it is very clever but there's a good chance you'll like it better than I did. I don't exactly see how the bill passing through the pen proves that the power of the pen trumps the power of money but either way, coming up with a different patter shouldn't be too hard. This is a variation of a beginner's trick we've all learned but its used in a very different way and is unrecognizable to people who know that beginner's trick. You do get a big kick doing the "move" so openly, you literally don't need to hide the move. This can be done surrounded 360 degrees as well as with people looking up at you and down at you. That's very rare for tricks that are 100% impromptu and that alone is enough to put it into worker territory. Some people may be turned off by the price tag, it may feel like a lot for what you're getting, but if you like what you see in the demo and think its worth $10 you won't be disappointed. This effect has that feeling of the magic trick that you saw an old man down the street do when you were 8 years old. That REAL magical feeling. "Classic magic" would describe this effect well. The only bad thing I can say about this download is the fact that I had to hear him say the word "right" every 4 seconds throughout the performance, and every 12 seconds in the explanation video. But I'll give him the benefit of the doubt. Afterall, it has nothing to do with how beautiful this impromptu effect can be, and he does a great job at teaching the little stuff. You may feel that he doesn't explain it clearly enough at the start, but don't worry. Stick with the video and you will be quite pleased. I know I am. I very much look forward to using this at the most random times. It's perfect for the bar, or after dinner with friends/family at the restaurant. Heck, maybe you can show your walk around magician a lil something if he comes by after dinner. Before I sign off, I just gotta say that I really enjoy this one a LOT, and I will be using it a LOT. It's worth the price, EASY, and if you enjoy magic with that classic feel, this one is SO MUCH FUN to perform! This one looks great, can be done on the fly and uses borrowed items. Worth the price to learn how to do this one. This effect is something of a parlor trick performed with borrowed items. Nevertheless, it definitely gets reactions from spectators. It's very easy to do, but may take a bit to get the routine and patter ironed out to fir your own style of performance. I feel like this is a perfect filler trick, as well as something to keep in mind in situations where you are unexpectedly asked to perform a "magic trick." Simple to learn, doesn't require you carry a bunch of stuff, and plays big with the audience. Great for those "small" stages. Recommended. The effect is good, the method is good, but the video is imho hard to understand. I am missing over-the-shoulder shots or a really close shot on how to wrap the bill. Also it is not very helpful to talk about the "circle on the Dollar bill", and it is never really shown where that circle exactly is. Given the fact that not everyone in the world has a Dollar bill in his drawer one more shot over the shoulder would have helped. So it took me a while to understand (3 times watching the video) the method. This won't blow people's minds, but it is a fun trick. What I love is that it's truly impromptu. If you take time to work some "magic" into it, you can steer clear of the "party trick" it can easily come across as. Slow it down and give it context, and you have something truly clever and unique. Not bad, good to have in your arsenal ready to go if you've have nothing else on you. This effect is fairly basic but it is as advertised. Impromptu, ungimmicked and as shown in the trailer. The developed banter is pretty good but also really necessary since it's not a "Wow!" trick for me. This tutorial would have been better with cuts to an over the shoulder view rather than the camera always out in front of the instructor. Even when the key move is explained you are not able to see what he is doing. This is a nice effect for a walk around routine in a restaurant or similar venue. I've enjoyed playing with it, and several times it has elicited gasps of disbelief. Personally I don't see it as a closer, but I do like the fact that you can borrow everything. It should be added to your close up repertoire because it can be a killer, and it only takes a couple minutes to really learn it.